Tonight, I attend my first ever Art Exhibit opening as the artist. I cannot begin to describe how this feels. Yesterday, I spent nearly 3 hours with a wonderfully helpful woman at the store, whose old job description used to include hanging fine art. Needless to say, she knew what she was doing. 3 hours, straightening this and that, aligning this one with that one, rearranging and re-hanging. When I finally stepped back to look, the pieces seemed to sing in a harmony that none of them had ever found while stacked up in my studio area. As an Awareness Artist, I didn't just make pieces of art to hang on the wall. My job is to inspire, practice, and teach meditative awareness and creative engagement. So included with each piece is a sign that offers a contemplation. I felt that the story behind the piece (the method) and a contemplation was what could take the viewer beyond an "ooh, that's pretty" reaction to a much deeper response...and hopefully, an engagement with their own thoughts as they leave the store. I have included below each picture the method and contemplation for each piece. I invite you to spend a minute in contemplation of at least one of these pieces that calls to you. I’ve worked with acrylics and mixed media on watercolor paper long before I started encaustic work. I began to miss using the wonderful texture of paper (while working on wood), so I decided to paint a bit of wax onto paper. I applied only a few layers of beeswax, as too many would make the piece too heavy to maintain stability. 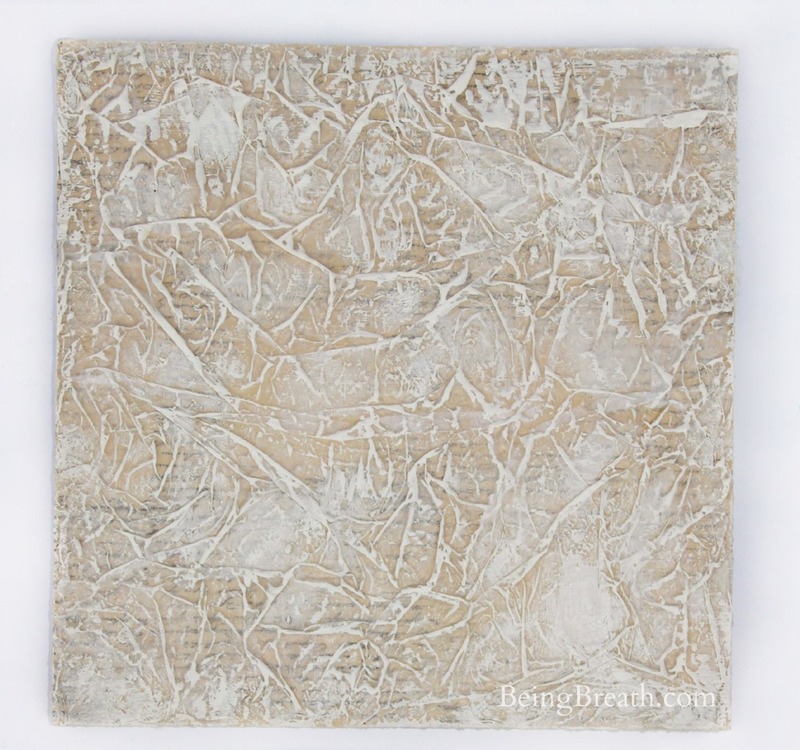 The colors were added with touches of rustic-colored encaustic wax and oil sticks carefully rubbed into (and wiped out of) the dips and grooves. I tried out many ways of completing this piece, finally deciding on the black and gold frame in order to enhance the warm sunset colors. A lone figure, shadowed by the setting sun. In this vastness, where does she go? Has he chosen this path, or is he aimlessly wandering? Is she near the end or the beginning of her journey? Expand beyond the horizon – where are you in this picture? This piece was an exploration in music and movement. Each stroke was made in coordination with the music I was listening to while creating it. 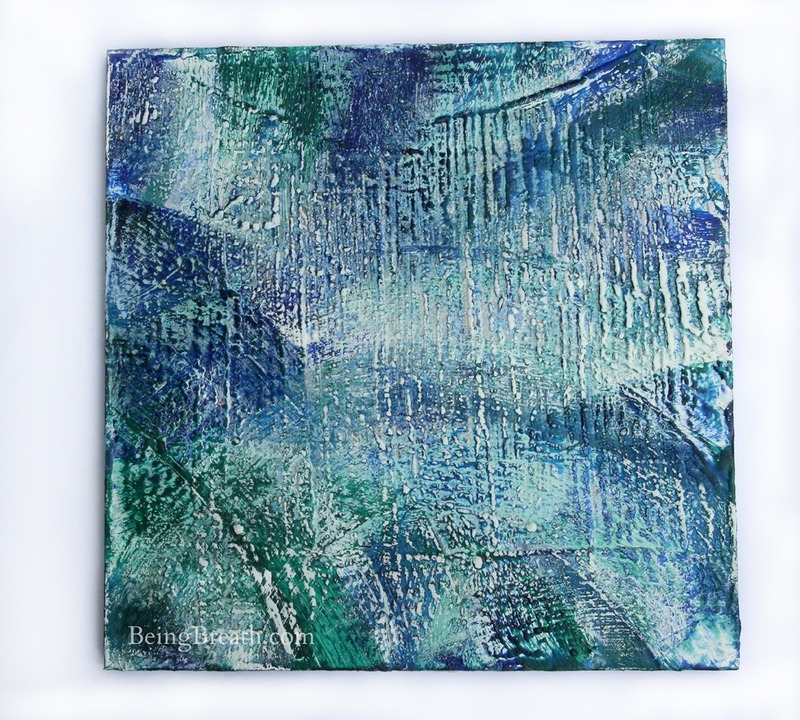 Many layers of beeswax, blues, and white encaustic paint were applied in arching and swirling movements. I made no attempt to smooth each layer. Therefore, the piece built itself up, creating the texture you see before you. The edges are finished with a textural acrylic paint mix. Through all of our movements, conscious or not, we create patterns. Many of these are habitual patterns. Can you see them in your own life? Does it look like what you desire it to be? If not, perhaps change your dance and, layer by layer, breath by breath, begin recreating your picture. A thin piece of board was covered with many layers of clear and lightly tinted wax. After measuring to ensure to two “cycles”, and using a tool specific for encaustic work, the flowers were drawn across through two birth, death, and rebirth cycles. Oil stick color was added to age and add dimension to the background. All things are impermanent. Even the things you love. Even you. And yet, there is such a deep beauty to this cycle. When you expand your view beyond judgment of birth and death, what can you see? Note: Art is 8" x 10" on cradled wood panel with finished sides. Photo is of top only and does not show depth. This technique of photo encaustic is one I am enthusiastically moving into. (A love of photography and a love of wax work well together.) This is an image of my daughter, slightly digitally altered, then printed onto photo paper and adhered to the wood panel. The sides were stained and painted, then taped to protect from wax. A few layers of beeswax and a touch of oil stick color created an ethereal mask to the image. No expectations in this moment. Pure engagement. What if you spent your day, or even just this moment, in wonder of what was around you – no matter how familiar it might seem? In what creative ways can you think to “stop and smell the roses”? One of the largest encaustic pieces created to date, BENEATH is an exploration of depth. Starting on a simple board of wood, I added multiple layers of beeswax, colored encaustic wax, oil stick pigments, and even Crayola crayon! I overheated the wax to allow it to flow into the shapes you see, manipulating some with a toothpick. I also used an encaustic iron to create some of the smooth and staccato textural waves. I painted the edges black, allowing for the many layers of wax to remain visible, then mounted it on another wood panel using blocks. This panel was inserted into the barn wood frame, which I had stained and painted a dark black. I purposefully chose the rough wood as a contrast to the smoother wax. Beneath the colors, beneath the texture, beneath the noise, beneath the beliefs, beneath the questions and the answers, beneath all definitions of you and me and us and them, there is silence. Can you hear it? 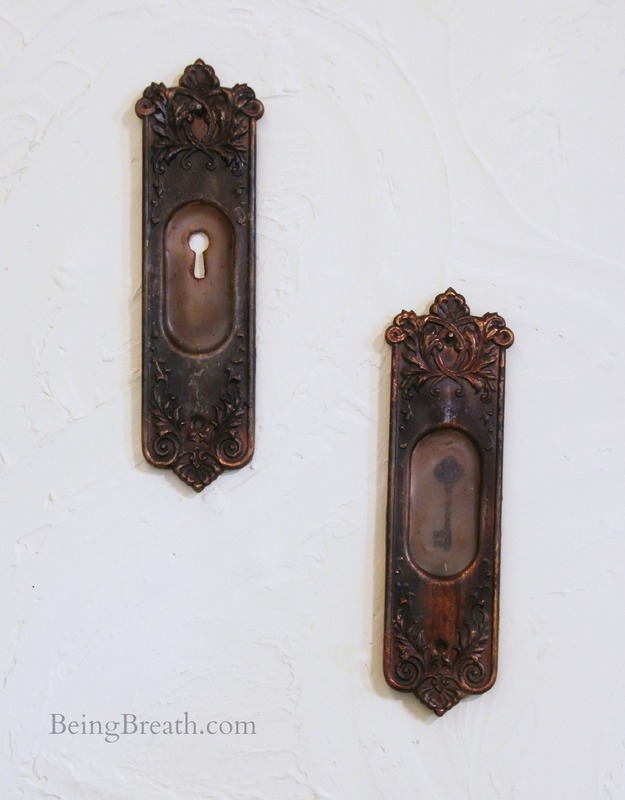 When I saw these two pieces in a local antique store, I immediately knew how I wanted to use them. Actually creating what you see was more of a challenge than expected. I poured the wax into the containers a few times, as the heated metal from the wax / fusing kept creating uneven surfaces. I carefully scraped the keyhole out of the wax using a thin clay tool. I placed the key onto the wax via a charcoal image transfer, and again, had to scrape and re-melt a few times due to the unique substrate. A bit of oil stick color created a more aged and blended look for each piece. You see the lock. You see the key. You see the problem and a solution. And yet, try as you might, you can’t quite grasp it. What if, instead of seeing a problem that needed a solution (that seems elusive), we saw something that was simply another chance to playfully engage with life? Instead of focusing on the lock and key, realize there is no door. The second piece in the wave series, I purposefully chose the oval piece of wood for this seascape. Several layers of beeswax were applied in order to provide a thick base onto which many passes of oil stick colors were laid. Using the heat gun and a toothpick, I manipulated the colors into a blend of swelling and circling waves. If you look closely, you can see that the final layer of (protective) beeswax was applied with a brush in a wave-like manner to follow the movement of the piece. All around us, noise and movement. Rising inspirations, crashing dreams, nonstop swells of energy. Again, that calm depth at the bottom, underneath it all. Can you find and stay within that peace while riding the waves? This was my first experiment in working with the premade raw wood (which quickly became a favorite substrate). The raw edges were taped to protect from wax. I then covered the flat surface with various layers of beeswax, colored encaustic wax, and green and blue oil stick colors. All of these were manipulated with the heat gun to achieve the “wave” look. The white oil stick color was added towards the end for the soft sky and caps and “sprays” of the waves. There is something within the depth, the scents, the movement of the ocean that speaks to something deep inside of us. Feel the wildness of the waves and the calm residing beneath them. Can you hold it all in your awareness? After a few successful attempts at using the raw wood, I finally decided to move forward with an image that had been playing in my head. 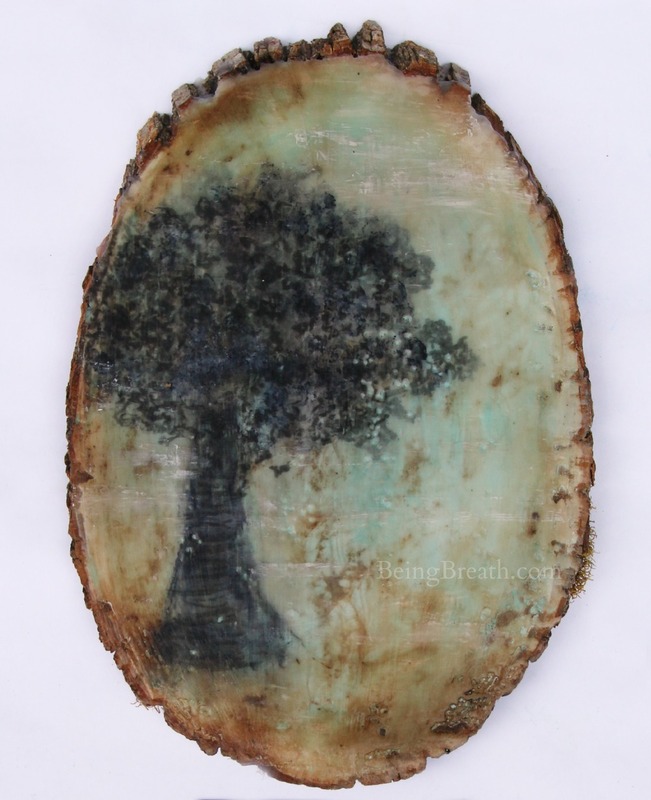 I began with a larger piece of the raw wood and an image I’d taken of a tree in Brown County, IN. Using charcoal, I carefully traced the details of the tree and transferred the image onto the layers of color and tinted beeswax I’d applied to the wood. Oil stick color created the moody and aged look of the background. What influences what? This item you now look at, a slice of a tree – where did it grow before it was cut down? Who touched it? Who or what planted it? Where is the rest of the tree? In 100 years, where will this tree on a tree be? Can you consider this cycle for other things – say, for your shirt? As we broaden our awareness, we find that everything is interconnected. This piece began with a bit of tissue paper and a lot of curiosity. I fully immersed the tissue paper in wax, then set it aside for later use. The 12 x 12 cradled board was covered in blank paper, then stamped upon to create a “storyboard”. I adhered the wax-covered tissue paper, heating and scrunching it up as it was applied to create the texture. A bit of white encaustic paint and oil stick color was worked onto the raised areas and into the grooves to create just the right amount of shadow, translucency, and secrecy. Stories, once told, perhaps recorded, frozen in the ice of time. What do we remember of those stories? What do we long for, stay attached to? How does it affect what we do with our moments now….and what stories will linger tomorrow? 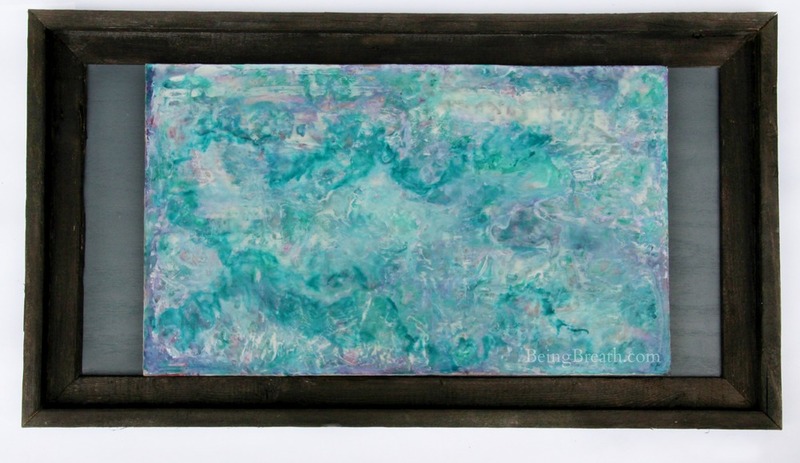 The encaustic board of this piece was created nearly a year before I found a way to frame and finish it. It started as a desire to express storylines. The stamped image in the middle is on fabric dipped in wax, then adhered to the white and blue wax-covered board. Thin, barely visible strings were laid vertically down the board. They begin in straight lines, slowly curving, turning into squirrely waves, and ending at the final straight line. These are meant to mimic the paths of our lives – first often delineated and directed through society and school, then more and more unsure and random as we explore our adolescence and adulthood. We all reach an end to the story, the finale to the composition, the final breath – a clear, straight finish. The frame completed the piece. Sheets of music from an old music book were adhered to the back (indicating the stories told through song) and aged with ink. 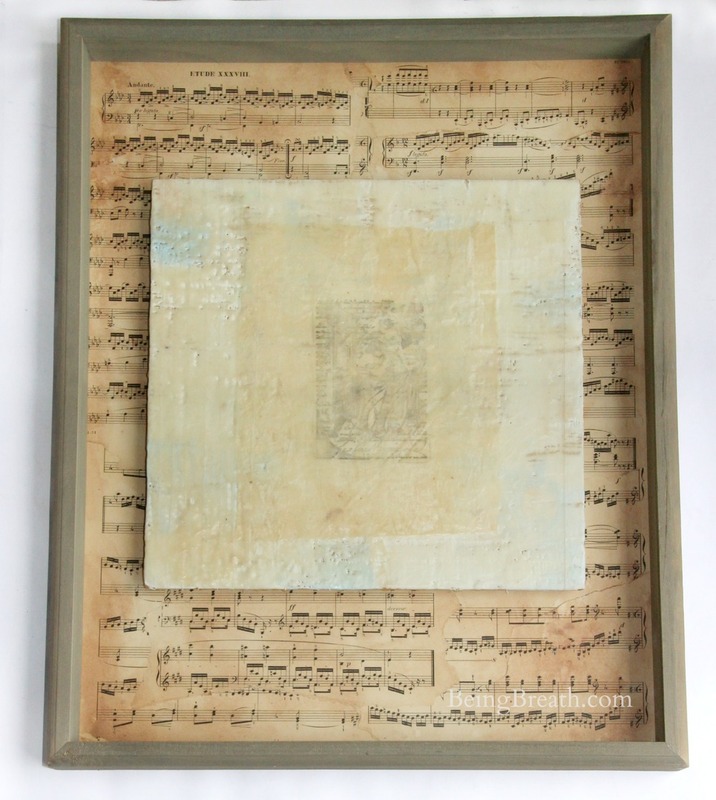 The encaustic piece was floated above the music by adhering it to wood blocks. There is much to consider here. Fall into the rhythm of your breath, and let the thoughts arise and drift away. When stories grab your attention, listen, reflect, and release. Hear the flow of the music. All pieces are for sale only at Patricia's Wellness Arts Cafe in Bloomington, IN during the show, which runs from Aug. 2, 2013 - Sept. 30, 2013. If you are anywhere near Southern Indiana in the next few months, I encourage you to stop by the store! 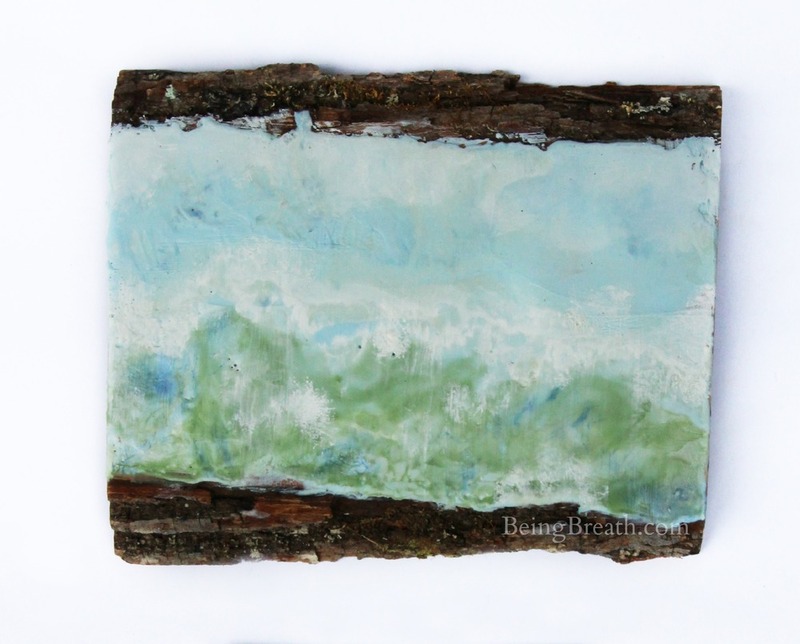 Photos cannot fully capture the depth, texture, and luminosity of encaustic pieces. I'd love to know - which piece or contemplation most deeply resonated with you? ?